The TTS's context menu can be accessed by right-clicking one of the tools in the list, or by pressing the "three bar" (menu) button just above the right side of the list. The context menu provides features mostly related to the hilighted item in the list, but the can also be related to all items in a group, or to all the items in the list. Below is the description of each of those features. The items in the TTS context menu may or may not be active, depending on the current hilighted item. 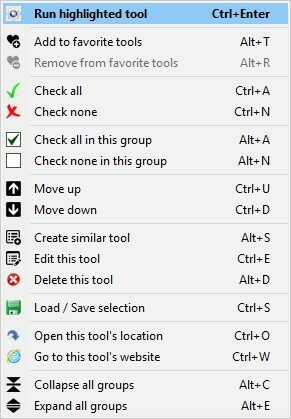 Run highlighted tool: Does the same as double-clicking an item. If the hilighted tool has not been downloaded yet, it will be downloaded and executed, otherwise it will simply be executed. This does not update the tool if it has already been downloaded. Add to favorit tools: Move the hilighted item to My favorite tools group. This group is placed above all other groups, and initially contains no items. This context menu item is grayed out for items already in My favorite tools group. Remove from favorit tools: This item is only active for items in My favorite tools group. It restores the hilighted item to its original group. Check all: Check all the items in the list. Check none: Un-check all the items in the list. Check all in this group: Check all the items in the same group as the hilighted one. Check none in this group: Un-check all the items in the same group as the hilighted one. Move up: Move the hilighted item up, in the same goup. Move down: Move the hilighted item down, in the same group. Create similar tool: This will allow you to create a tool based on the selected one. Initially, the new tool's fields are filled with the selected tool's settings, just like as if you were editing it, but it will be saved in the My own tools group instead. The built-in tools can not be edited directly because that would prevent them from being automatically updated. Edit this tool: Edit the hilighted tool. This item is grayed out for built-in tools. More info here. Delete this tool: Permenently delete the hilighted tool. Note that you can hide the tool instead. This item is grayed out for built-in tools. Load/Save selection: Save the current selection of tools and group expansion state to a file, or load them from a previous save. More info here. Open this tool's location: Open the location of the hilighted tool. This is the path of the downloaded file, except if it is a zip file, in which case the location is the folder the zip file was extracted to. Go to this tool's website: Open the web page of the hilighted tool with the default browser. Collapse all groups: Collapse all the groups in the list. Expand all groups: Expand all the groups in the list. The items in the context menu can also be accessed by their associated hotkeys, which are displayed in the screenshot above. To close the context menu, click anywhere in the screen.